CASA AERATA is located at 9 LORONG 26 GEYLANG in district 14 (Eunos, Geylang, Kembangan) of Singapore. 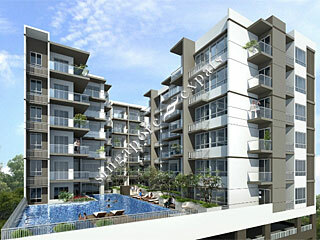 CASA AERATA is a Freehold Condo development consisting of 78 units. CASA AERATA is completed / TOP in 2014 (estimated), developed by ECCO REALTY PTE LTD.
Educational institutions like ETONHOUSE INTERNATIONAL SCHOOL, CANADIAN INTERNATIONAL SCHOOL (TANJONG KATONG), CHATSWORTH INTERNATIONAL SCHOOL (EAST), KONG HWA SCHOOL, GEYLANG METHODIST SCHOOL (PRIMARY) and MACPHERSON PRIMARY SCHOOL are near to CASA AERATA. CASA AERATA is accessible via nearby ALJUNIED, DAKOTA and MOUNTBATTEN MRT Stations. Modern condo with good sized swimming pool, balconies and nicely landscaped gardens and carparking. Great location with Aljunied and Dakota MRTs 5-8 minutes walk, buses to Orchard and CBD on Guillemard and Geylang Road. Near park connectors for East Coast Park, CBD and Gardens by the Bay. Centrally located, convenient, close to many eatery places. Good value for money. Great city location, but within easy reach of east coast and gardens by the bay. Cycle to work! Modern apartments with large balconies and good layout. Near CBD and East Coast Park connector for easy access to both city and parks, best of both worlds!